The Forgotten Fear: Where Have All the God-Fearers Gone? The fear of God is an important theme in the Bible, yet many Christians today overlook it or treat it carelessly. Fearing God is the soul of godliness, and those who claim to love God should desire to understand what it means to fear Him. 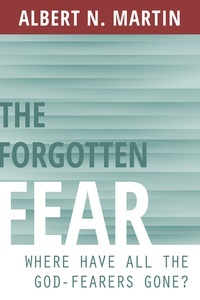 The Forgotten Fear revisits this important topic. Author Albert Martin first establishes the theme of the fear of God in both the Old and New Testaments, and then defines what fearing God means. Finally, he addresses the practical implications of fearing God, showing its expression in the lives of Abraham and Joseph and providing instruction for believers today to maintain and increase their fear of God.